PS1COSMO - Jones et al. and Scolnic et al. 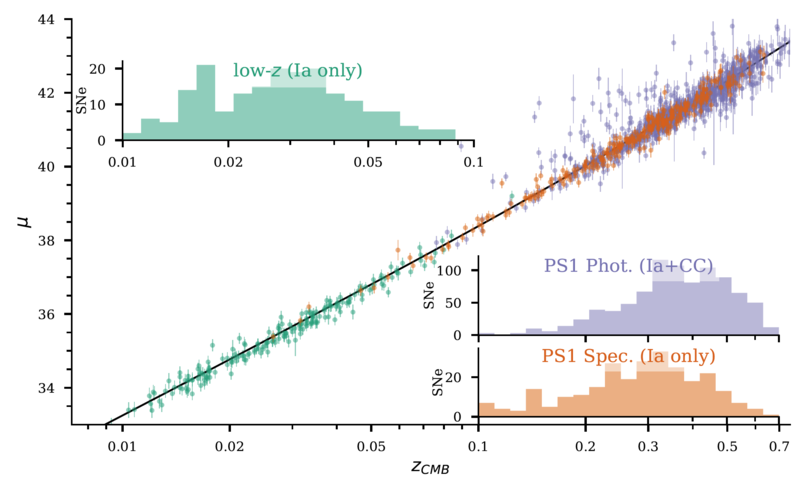 The PS1+low-z Hubble diagram with low-z SNe Ia, spectroscopically classified SNe Ia, and photometrically classified SNe. The data that appear much fainter than ΛCDM (black line) are likely CCSN contaminants. We use 1,369 SNe to measure cosmological parameters. From Jones et al. (2018). Confidence contours from the Pantheon analysis at 68% and 95% for the Ω_m and w cosmological parameters for the wCDM model. 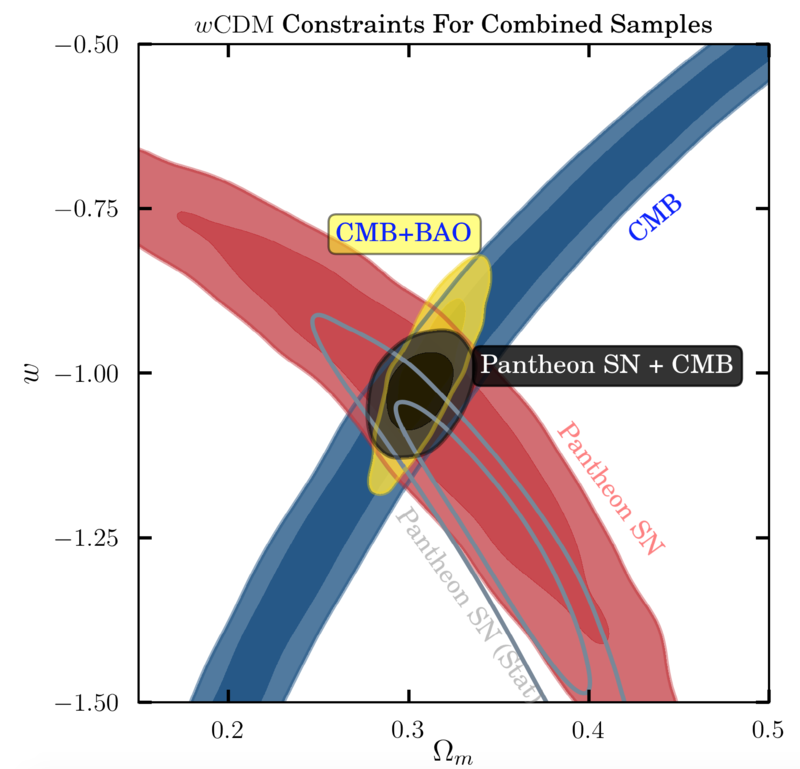 Constraints from CMB (blue), SN - with systematic uncertainties (red), SN - with only statistical uncertainties (gray-line), and SN+CMB (black) are shown. From Scolnic et al. (2018). The Pan-STARRS Supernova (PS1 SN) Cosmology data release contains light curves, host galaxy spectra, light curve parameters, distance measurements, and cosmology fitter input files that can be used to measure the dark energy equation of state using two PS1 SN datasets. The first dataset (Scolnic et al. 2018) is the Pantheon sample, which combines spectroscopically classified PS1 SNe Ia with Sloan Digital Sky Survey, SuperNova Legacy Survey, and Low-z SNe Ia. These SNe were used to measure the dark energy equation of state in Scolnic et al. (2018), who find a value of -1.026 +/- 0.041. The second dataset (Jones et al. 2018) includes 1,169 Pan-STARRS SNe without spectroscopic classifications. Approximately 95% of these SNe are of Type Ia, with the remainder being Core-Collapse (CC) SNe. Jones et al. (2018) use a Bayesian methodology to marginalize over CC SNe in these data and, after combining the sample with low-z SNe Ia, measure the dark energy equation of state to be -0.989 +/- 0.057. You can refer to the full collection of PS1COSMO data products in papers or webpages using the DOI http://dx.doi.org/10.17909/T95Q4X. In addition to these data files, a GitHub repository containing software input files and instructions for running is CosmoMC is available. Note that some of the data files in that GitHub repository have different file names than the ones archived at MAST. Interactive tables of the supernovae are available for both the Jones et al. and Scolnic et al. collections. These tables are sortable, filterable, and also provide download links to the various data products from each collection.